26 November. 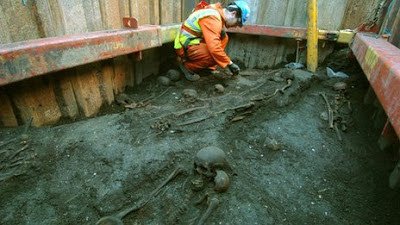 The Museum of London's excavation is now complete at the 8-10 Moorgate site. Portions of the Roman-era (1st-3rd c AD) town were uncovered, along with at least one human burial. No pictures, sadly. 30 November. Workmen installing a spa in a house in Teesdale (England) found Roman coins, pottery, glass, and a roof tile with a handprint on it dating roughly to the 2nd century AD. No bones, it seems, but I do love finds of Roman hand- and footprints. Again, sadly, no pictures. 4 December. The tomb of the Roman man who inspired the movie Gladiator is set to be reburied in Rome. Four years ago, archaeologists found the tomb of M. Nonius Macrinus, but a lack of funds is forcing them to rebury it or risk losing the site. 24 December. Although this isn't totally Roman-era, I was interested to learn that a portion of Phillip II's skeleton would be studied further. Phillip of Macedon was the father of Alexander the Great, and Greek archaeologists think that the remains they found at Vergina are indeed his. 24 December. Large-scale excavations under London are also revealing the city's Roman past, among other eras. So far, archaeologists have found "hundreds of skeletons," although there's no indication what time period they date to. 28 November. Bos et al. in PLoS One - Yersinia pestis: New Evidence for an Old Infection. There's been a rash of articles about the Black Death lately, but this one is noteworthy because the authors attempt to pinpoint divergence dates for various strains of Y. pestis. One happens to coincide with the dates of the so-called Plague of Justinian in Late Antiquity (6th-8th centuries AD). 9 October. Katy Meyers at Bones Don't Lie reviews a 2010 article by Becky Redfern on surgery and fracture treatment in Iron Age and Roman Britain. 23 December. The "bambino di Fidene" (a 2nd century AD Italian child whose skull has evidence of a trepanation) gets a nice write-up in the Italian newspaper Corriere della Sera. 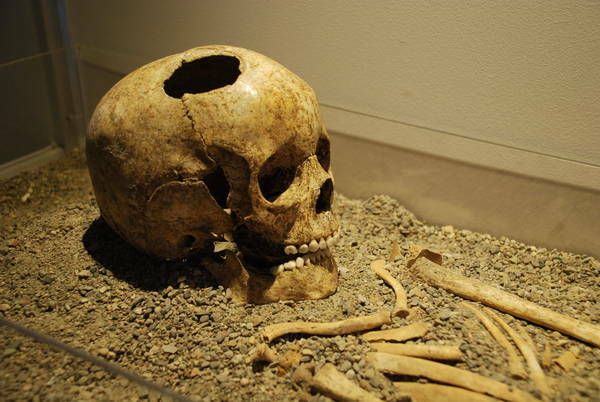 This individual is being exhibited as part of a new(ish) exhibit at the Museum of the History of Medicine in Rome. The news piece is almost an osteobiography, taking the reader through the possible reasons the child was trepanned and the palliative care for the child who had to undergo such a traumatic procedure. On the names of prostitutes recorded at Pompeii. 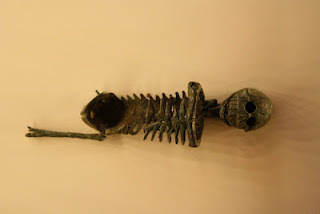 That concludes your Roman bioarchaeology news for 2012. Join me here each month next year for more!